It’s only when I am with someone visiting from out of town that I remember that San Francisco has a definite vernacular architecture. People tend to think “Victorians” when they think of San Francisco, and most specifically, of Alamo Square’s Postcard Row (which we pass nearly every day en route to school). 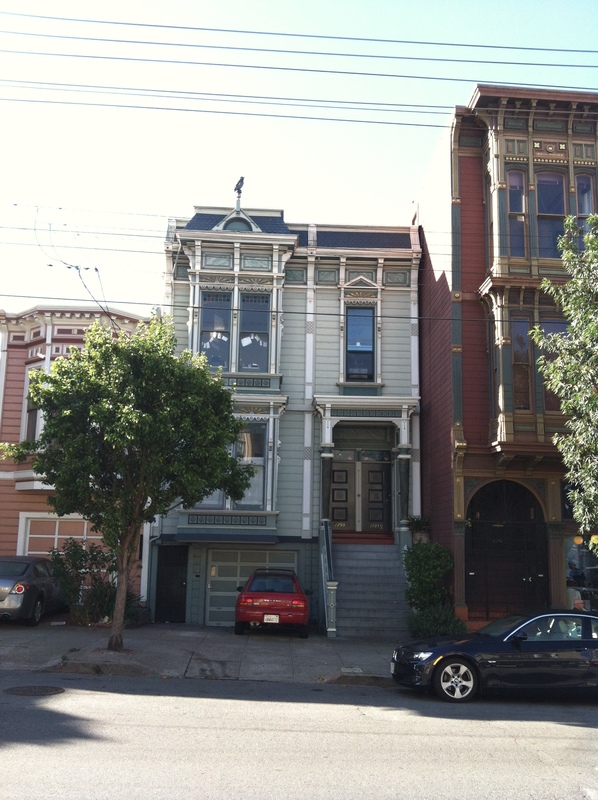 But although San Francisco is in fact filled with Victorians, what always seems to surprise people most is that almost none of them are single-family homes. This is a densely populated city, and what looks to suburbanites like a single family house from the outside is almost always a multi-unit building. It always seems to surprise visitors that that “house” they are admiring is in fact many homes. On the bike I always move at a slow enough speed to admire these homes, but lately I’ve been moving even more slowly so I get an eyeful. 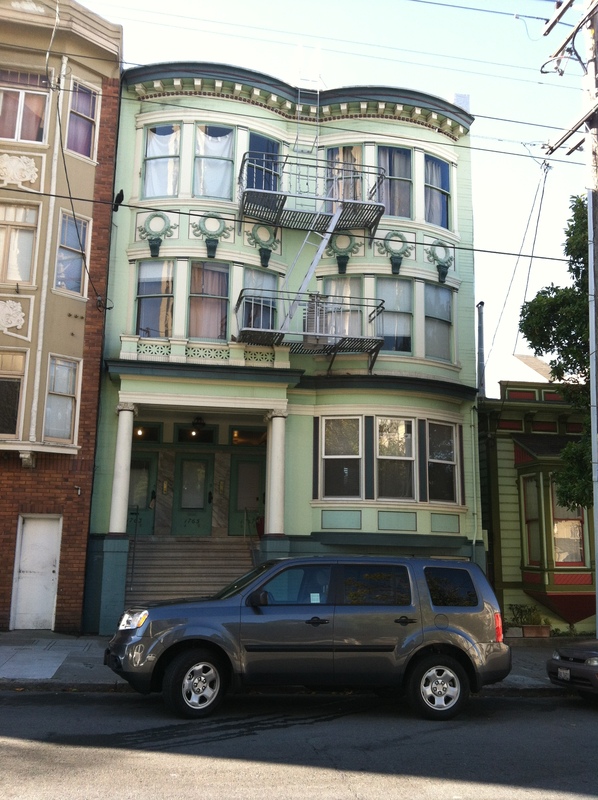 I’ve never seen a Romeo flat anywhere but San Francisco, and even here they’re rare. Romeo flats are typically six units, two to a side on three floors, with open Juliet balconies between the floors. I pass this building on Beideman in the Western Addition when I’m riding with my daughter home from preschool. The Western Addition is considered to be kind of rundown but I like these pretty side streets. 49 Beideman in this building is actually listed for sale right now—2 bedrooms and 1 bath, 620sf, listed for $480,000, although it will undoubtedly sell for well above asking. Anyway, it’s a lovely building and next door to a pocket park, if you are in the market. Much more typical are two-flats. 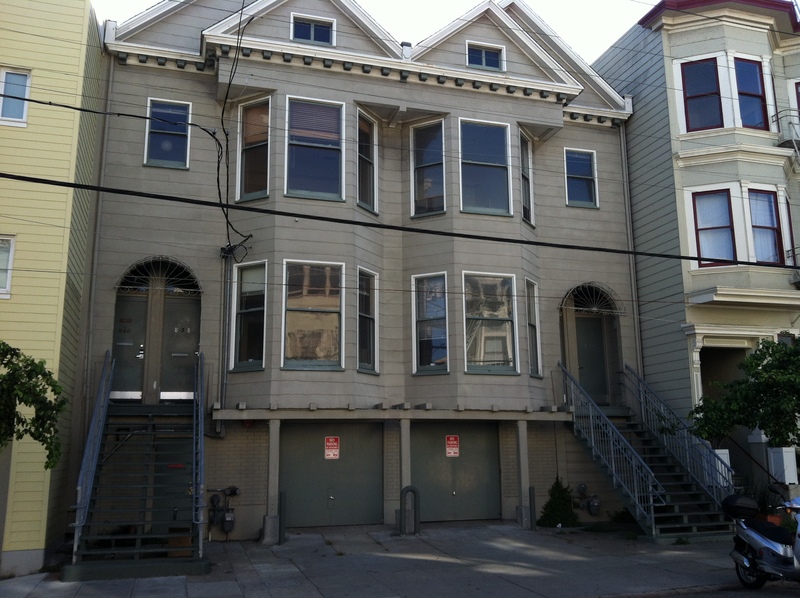 Although this building is in the Western Addition on Fulton, our inner Sunset neighborhood is almost exclusively made up of two-flats, either like these or Marina-style that have a shared yard in the back, with large apartment buildings on the corners of each city block. Unfortunately I couldn’t photograph most of the more attractive versions of these buildings, which typically have trees in front of them that block a good picture. The basement tends to have either a shared garage and storage or a shared garage and a studio apartment (often unpermitted). Thanks to this density, trick or treating is laughably easy in our neighborhood, despite the endless hills and stairs. If the building has another story it’s a three-flat. The three flats with three front doors like this one are obviously multi-unit buildings once you look closely at the front porch, but it’s not uncommon for multi-unit buildings like these to have a shared front door. With a three-flat the first floor unit tends to be smaller than the other units, and we’ve met lots of families that use the space under the stairs as a kids’ bedroom. (There is a strong market in built-in bunk beds that can be squeezed in the Harry-Potter-bedroom-under-the-stairs in this town.) The premium on space is part of the reason it is rare to find families with more than two kids in San Francisco, unless the second pregnancy was twins. With a slightly wider lot you can find four-unit and six-unit buildings, which are basically two-flat and three-flat buildings stuck together. 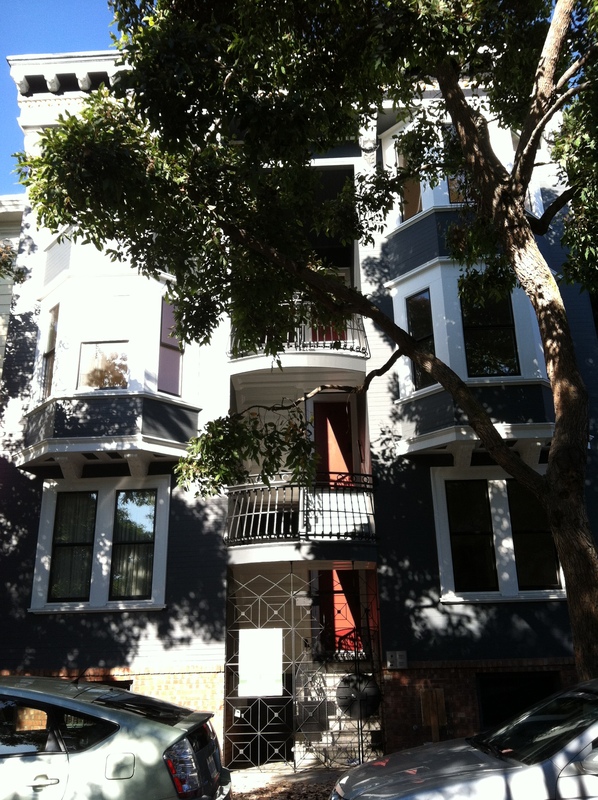 I see a lot of these buildings in Lower Pacific Heights near my daughter’s preschool. This four-unit building is a particularly ugly version of the genre, but the prettier ones are hard to photograph because they typically have trees in front and a long flight of stairs up to the front doors. Oddly, our street is one of the few that is made up of largely of single-unit buildings. The university converted all the houses it purchased on our street to clinics decades ago. Then when the neighborhood protested because of all the car traffic, the university turned the buildings back into housing. However approximately half of them were set up as student housing, with a shared common space and multiple rental bedrooms. Evidently you can cram more people into a building that way. These aren’t exactly single family homes, since they each contain at least a half dozen medical students, but technically they meet the definition. It is no fun to live next to students, incidentally, even medical students. No matter how much homework I give them, they party all weekend well into the wee hours. It’s something about student culture. Even nice quiet professionals who go back to graduate school end up partying when they are students again. Every year we hope against hope in the fall when they return from their vacations that the ones with the gong have finally graduated—so far university police have not been able to identify which unit has the gong, to our despair. And despite the fact that fewer than 1% of physicians smoke, in their student years they smoke outside our building and leave butts all over the ground, which our kids are finally old enough not to put in their mouths, thankfully. They drive down the hill at breakneck speeds until the wee hours with the music blasting, or worse, sit in their cars outside our building and look completely shocked when we come out in our pajamas at 3:00am to say that we can in fact hear the thumping bass from three floors above. And to my everlasting regret, the university keeps all its housing units in good condition, and the most raucous parties always gravitate to the nicest space. Summer is always the nicest time of the year for us. Even though it is a violation of their leases to sublet their rooms in the summer, and even though every year someone gets kicked out for it, the students always sub-lease anyway, and the sub-lettors tend to be fearful and thus quiet. But I realize that it could be much worse. We could live next to undergraduates. I loved visiting San Francisco several years ago, loved its buildings, loved going to services in Grace Cathedral. I live in an equally hilly little city, which I use as an excuse not to get on a bike, but clearly that is not an excuse for you (nor a broken leg!). It’s just getting up momentum to start. How did you go at the beginning? Lots of walking up hills? There was some walking up the hills, and some really slow riding up the hills. And when I started I didn’t ride every day, which helped a lot. I worked up to the daily rides. And fortunately for me, SF has the Bikesy app, which offers some alternate “avoid hills” routes where that is possible, and I used that a lot too.